In 1935 King George V celebrated 25 years on the throne, and as part of the jubilee celebrations, Quorn Urban District Council presented a commemorative book to children in the village. 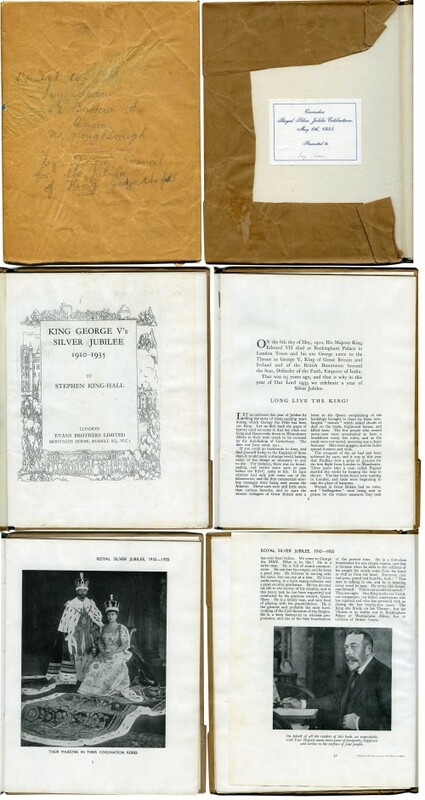 The 32 page, blue covered hardback was called ‘King George V’s Silver Jubilee, 1910 – 1935’, and written by Stephen King-Hall. This copy was presented to 13 year old Ivy Dean, who lived with her parents, John and Edith Dean and three siblings on Barrow Road in Quorn. Ivy (full name Edith Ivy Dean) married Jack Rudkin in 1943 and they continued to live at 44 Barrow Road. A photograph of Jack and Ivy can be seen in artefact 1276. Thank you to John Rudkin, Jack and Ivy’s son, for lending the book to the museum.